Admiral Flota Sovetskogo Soyuza Kuznetsov is a Project 1143.5 Heavy Aircraft Carrying Cruiser, the only Russian aircraft carrier. The carrier (project name was Sovetskiy Soyuz) was laid down at Chernomorskiy (Black Sea) Shipyard on September 1, 1982 having original name of Riga and launched on December 4, 1985 with name of Leonid Brezhnev. 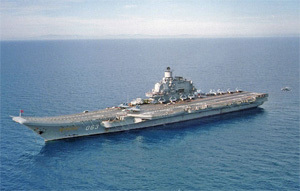 On August 11, 1987 it was renamed as Tbilisi and since October 4, 1990 became Admiral Flota Sovetskogo Soyuza Kuznetsov. It joined Northern Fleet on January 20, 1991. On October 21, 1989 the uncompleted and underequipped carrier was put to sea for flight development tests of deck-based aircraft. First deck landings of MiG-29K, Su-27K and Su-25UTG were carried out on November 1, 1989. The ship was inactivated for further fitting-out on November 23, 1989. In 1990 it passed multiple sea trials. In 90-ies the carrier regularly participated in naval exercises and was deployed in the Mediterranean. Since 1996 till 1998 it was under overhaul. In 2000 it took part in exercise where Kursk submarine sank; the carrier participated in rescue operation. Since 2001 till 2004 it was under repairs. In 2004 the aircraft carrying cruiser took part in one-month cruise to the North Atlantic. In the period of 2005-2007 it took the sea several times a year. On December 5, 2007 it headed task unit in the cruise to the Atlantic and Mediterranean Sea which ended on February 3, 2008. The carrier was under overhaul till December 2008. Since December 6, 2011 till February 16, 2012 the ship was on long-range cruise to the Mediterranean Sea maintaining presence of Russian Navy in key regions worldwide. The carrier is armed with missile launchers (12 Granit antiship missiles and 60 Udav-1 ASW rockets), Klinok SAMS (192 missiles, 24 launchers) and Kashtan CIWS (256 missiles). The cruiser is capable to carry up to 24 Ka-27 multipurpose helicopters, up to 16 Yak-41M supersonic VTOL multirole aircrafts and up to 12 Su-27K deck-based fighters.